The snow of last winter is a distant, yet raw memory. 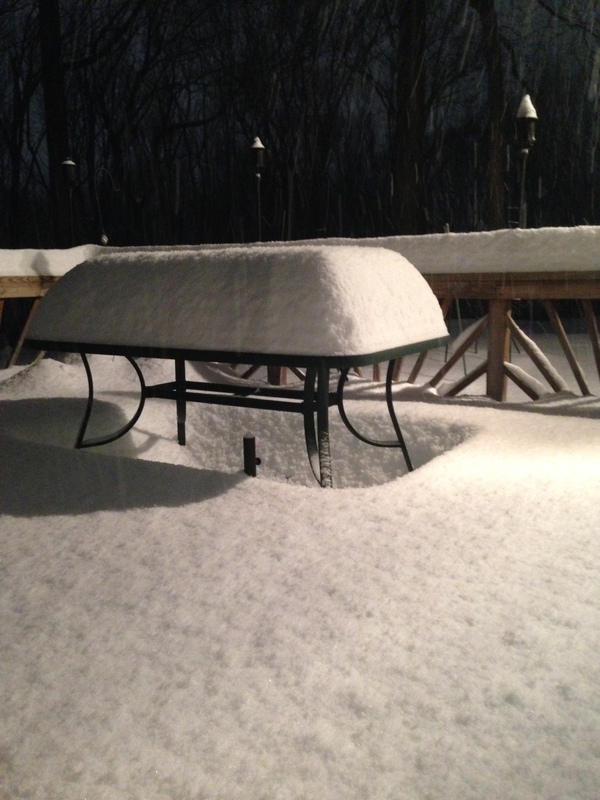 One of the many photos we took of snow last winter…our table is currently covered with fallen leaves. Fortunately, the leaves are not as deep. 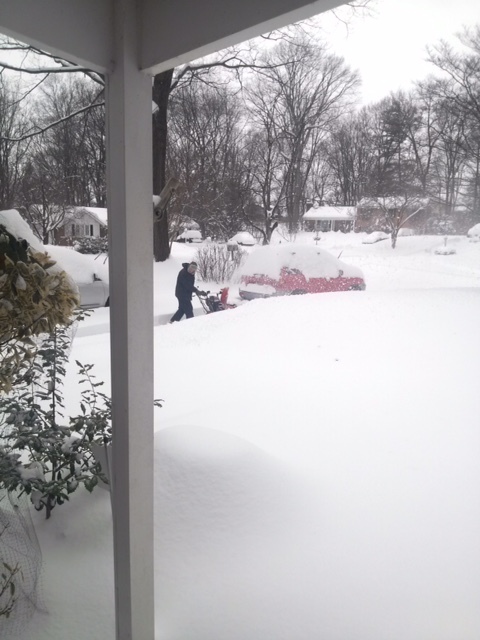 Several years ago when the Son-sters were away at college and not available to shovel, Hubster knew it was time to acquire some heavy machinery. He doesn’t pull it out for every snow event, but this storm, which kept him home from work proved “blower-worthy”. Don’t worry Son-sters we still have shovels in case you would like to visit and reminisce about your “glory days” in snow removal. For a teacher a snow day is both a blessing and a curse. There is nothing better than staying in the comfort of my home in pajamas and binge watching The Real Housewives of Somewhere to keep me company, but then there is the thought of making up the school day, missed lessons and continuity of instruction. 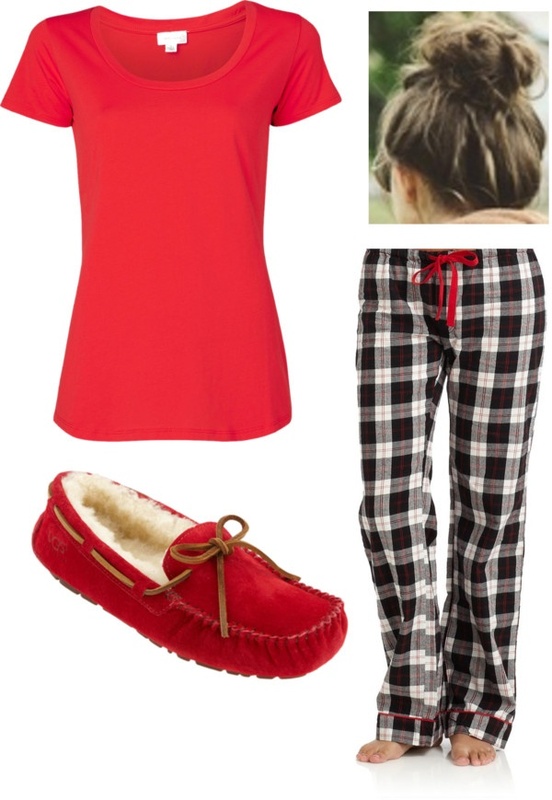 I actually have those pajama bottoms, red top and enough hair for a bun. Now that I have professionally addressed the academic concerns of a snow day with winter still eight plus weeks away, here is the real reason for mentioning the subject. Last fall, as Christmas discussions approached with my younger colleagues many of whom have daughters reaching the American Girl (AG) Doll age appropriate years; I listened as they were trying to justify the cost of the doll, clothing and various accessories. As a surprise for my colleagues, I decided to sew each a coat for the dolls. I purchased a pattern, but I wasn’t thrilled with the style nor am I very good at following a pattern as previously mentioned here. 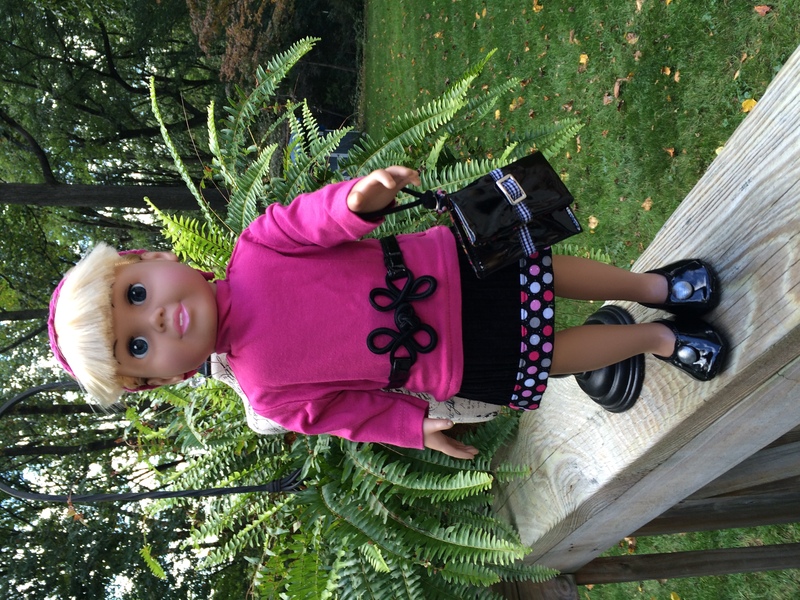 To overcome this fashion dilemma, I spent hours looking at coats sewn for dolls on Pinterest and Etsy. I persevered and the coats were finished in time for Christmas. My colleagues were thrilled to have a handmade gift to place under their trees. 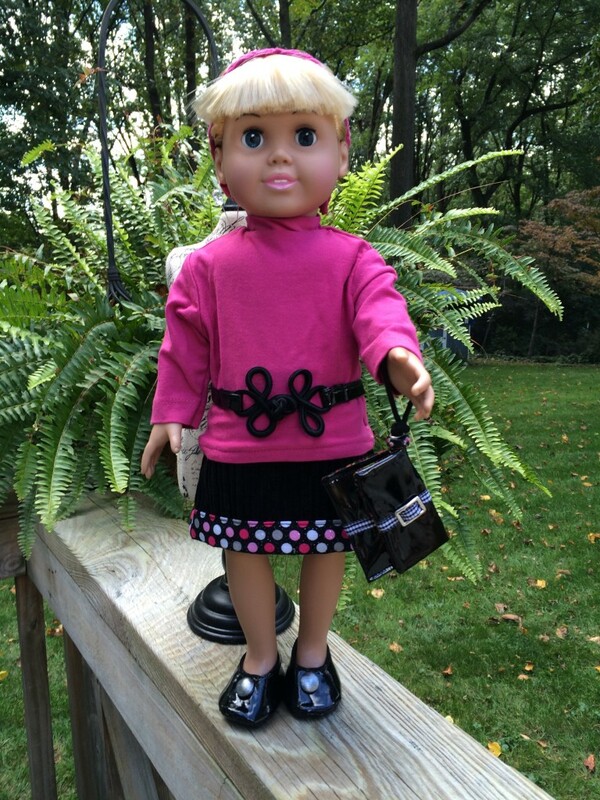 I didn’t take any photos of the coats, but I did receive a few photos of the girls with the dolls wearing their coats. Needless to say, I was a bit bitten by the design bug. Luckily, as mentioned here I had/have plenty of fabric, but I didn’t like the patterns with what seemed like out of date clothing so I made my own. Since we had about a million 10-11 snow days last school year and for the first time in the 15 years that we have lived in this house during a snow event we didn’t lose power I was able to accomplish some serious designing and sweatshop sewing. Once complete, I stored the clothes for a long spring and summer nap. Recently, I pulled out the doll clothes in order to package the outfits so that my colleagues could have the specially designed outfits well before they started their pressure filled holiday shopping season. I had a small mannequin that I used when I was designing, but I also hijacked borrowed a faux AG doll in order to snap a few runway photos of my own. I loved this “J. Crew-esque” herringbone vest. I am still trying to find it for myself. The shoes are supposed to be a touch of Tory Burch (TB) (sorry Tory). 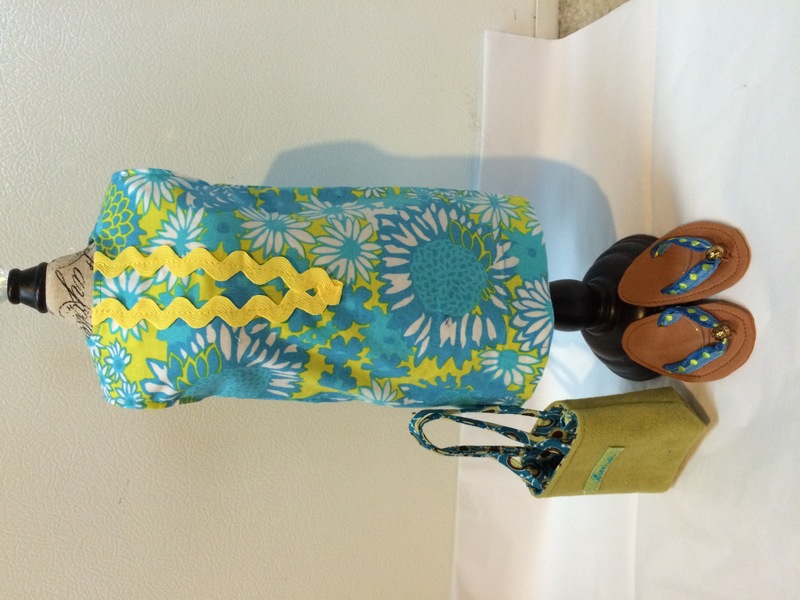 The bag is intended to have a Vera B. flair…. 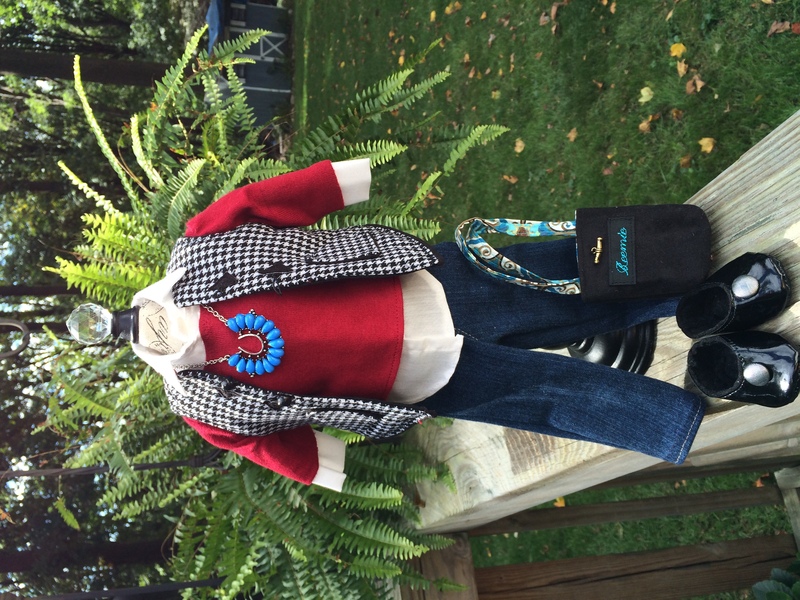 I made everything…button down blouse, sweater, jeans and necklace. A girl can never wear too much pink or prance in too many pom-poms. The pink suede bag with chain straps, grey suede boots and belt with studded buckle were my favorite part of this outfit. When someone says exercise I always think they say accessorize…thus the overuse of accessories. The French Knot patent leather belt and clutch bag take this girl from day to night. The “TB’s” can be worn with many different outfits. A girl likes to have a”go to” pair of flats no matter what the nuns ever said about patent leather shoes. 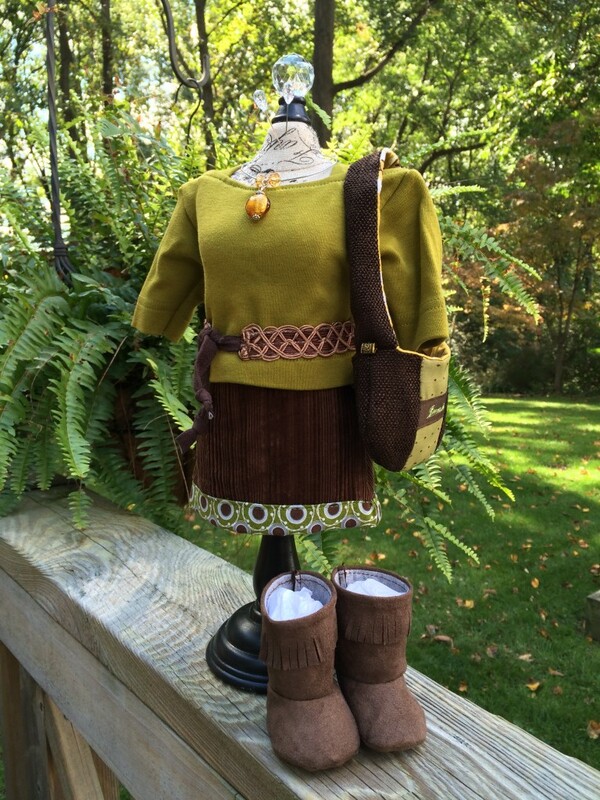 This was Boho inspired outfit…with influence from the Wild West with its amber accent necklace, corduroy skirt. 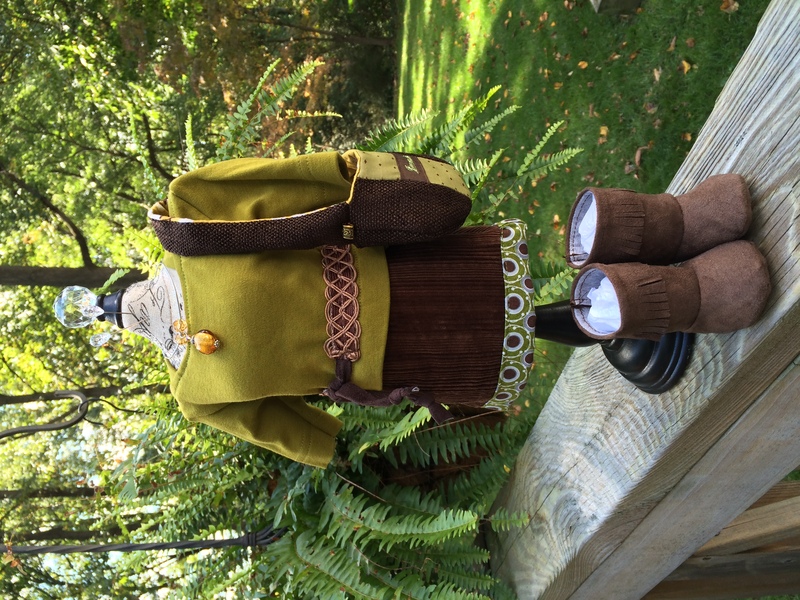 braided belt and fringed boots. I might need to make that sling bag in adult size. 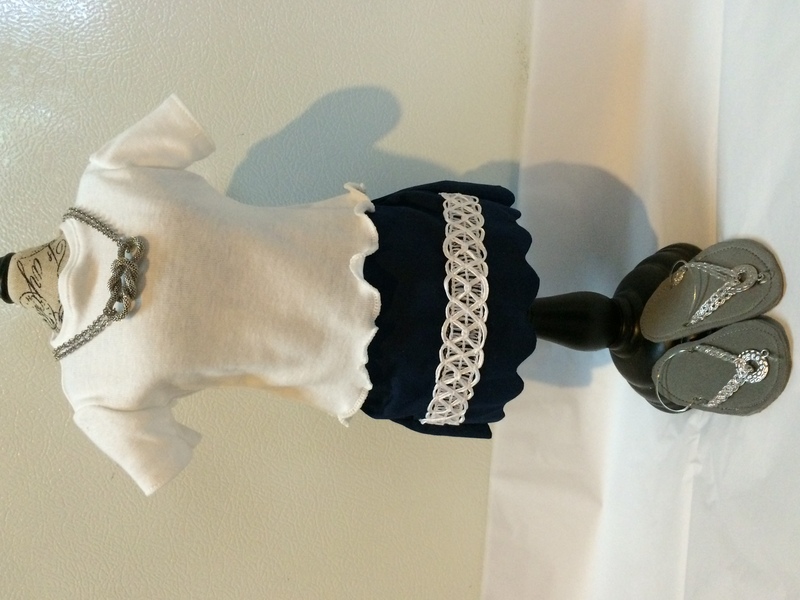 Who doesn’t love a crisp white tee with navy scalloped skirt grey flip-flops with metallic accent. The sailor knot necklace makes this perfect for lunch at the yacht club or just by the sea. 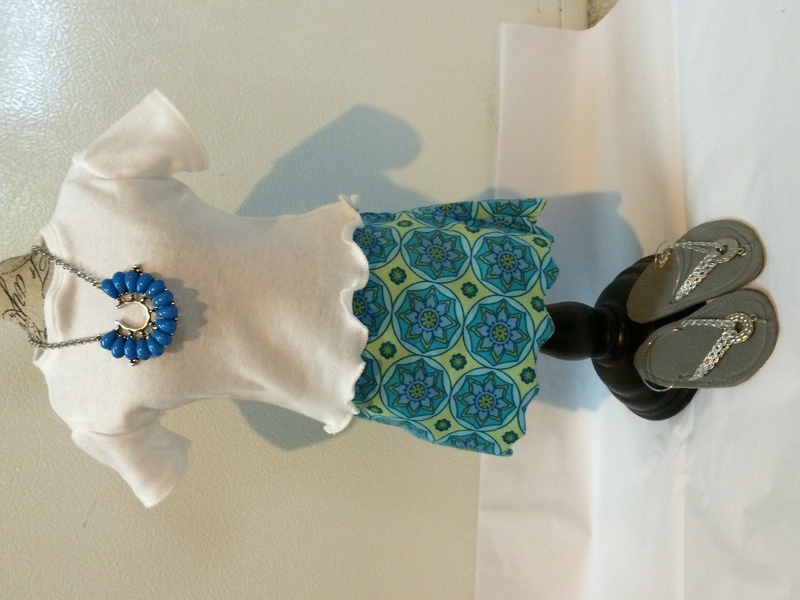 The flip-flops really stay on the doll…no blow outs to worry about. A “Lilly” among the bristles…my take on a rose among thorns or just blatantly trying to duplicate a famous designer, initials LP. 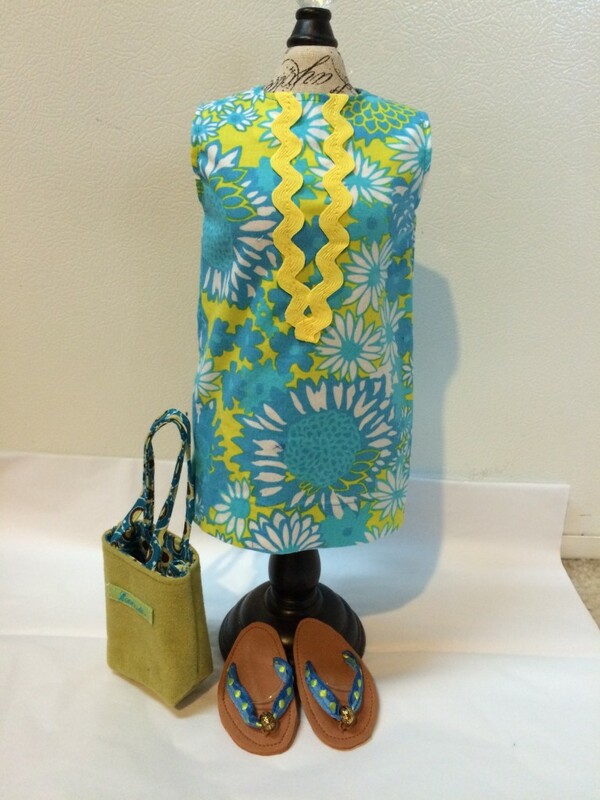 The bag and flip-flops were not intended to go with this, but I couldn’t let this shift stand alone. Necklace is from the fall/winter collection, but really makes a statement with this ensemble. Sew it seams (not misspelled) I may have gone a tad overboard with the designing and sewing of doll clothes. Since I am the mother of sons I never had a chance to make doll clothes for my own daughters so maybe someday there will be grand-daughters…although Son-sters I am not in any rush. I have said, “auf Wiedersehen” to the fashions and my colleagues were so excited to open the outfits for their girls’ dolls. There is great joy in giving. For now I am done playing. 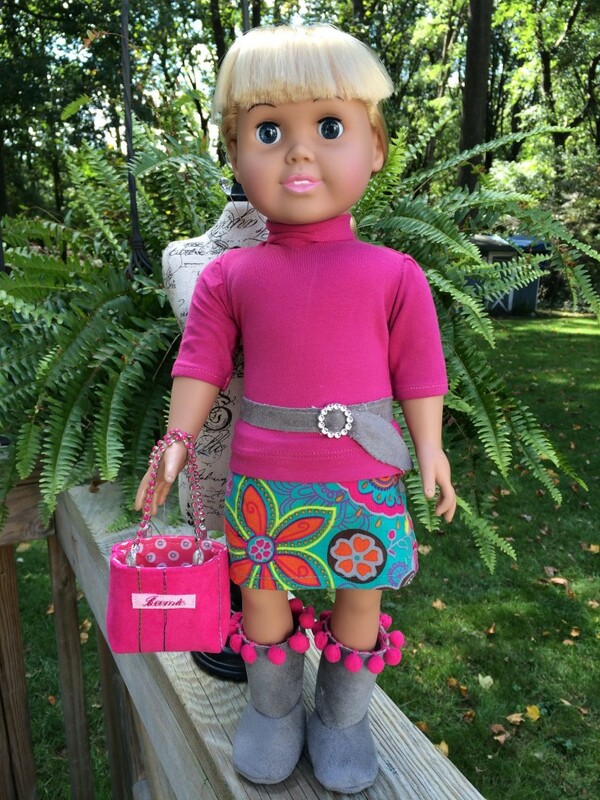 The faux AG doll was returned safely to its rightful owner… Several have suggested I start this as a business…unfortunately, this business does not come with any health benefits, unless you include good for my mental health. 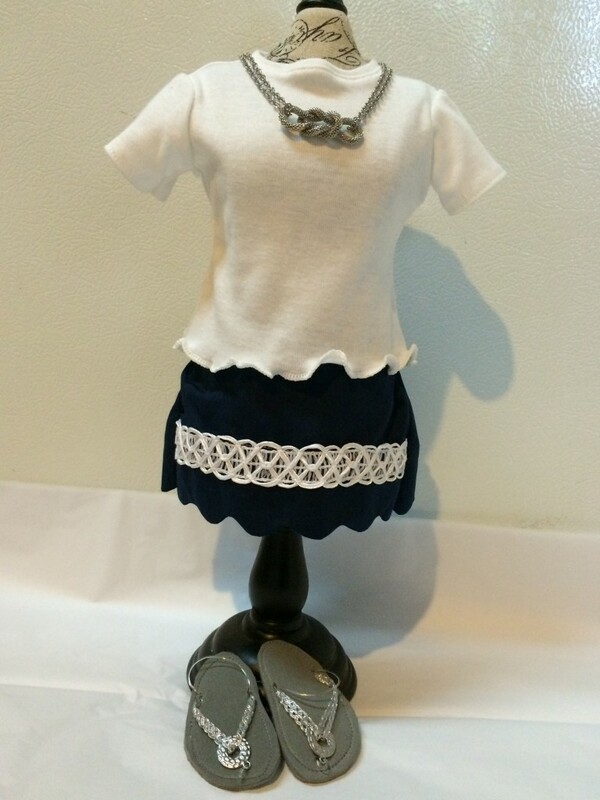 This entry was posted in Sewing, Uncategorized and tagged American Girl Doll, doll clothes, flip flops, handbags, purse, sewing. OH MY GOODNESS! Beemie you are SERIOUSLY talented! Thanks…this was lots of fun…got my girl thing. 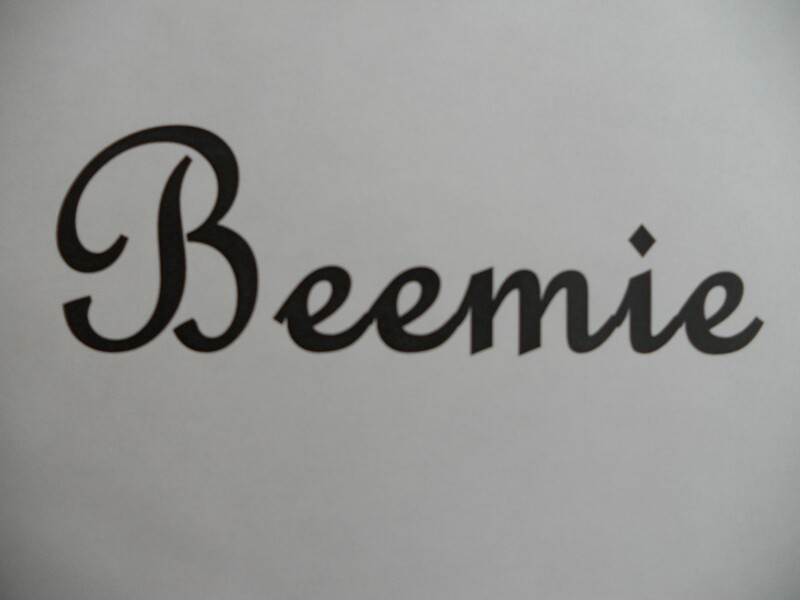 OMG Beemie. These outfits are positively adorable. You should start a business. Bet you would make beaucoup bucks. Have a great week. Thanks …as much as I would love to just design and sew…real life and real bills come first…who knows maybe in the future. Seriously, the first outfit you would wear in real life, am I right? So sad for K’s “Baby John” that she’s too far to benefit from your talents, which are many. Wishing you the perfect number of snow days to indulge in your passion this winter. Although if I’m being completely honest, those snow pics were hard to look at…that was one tough winter! 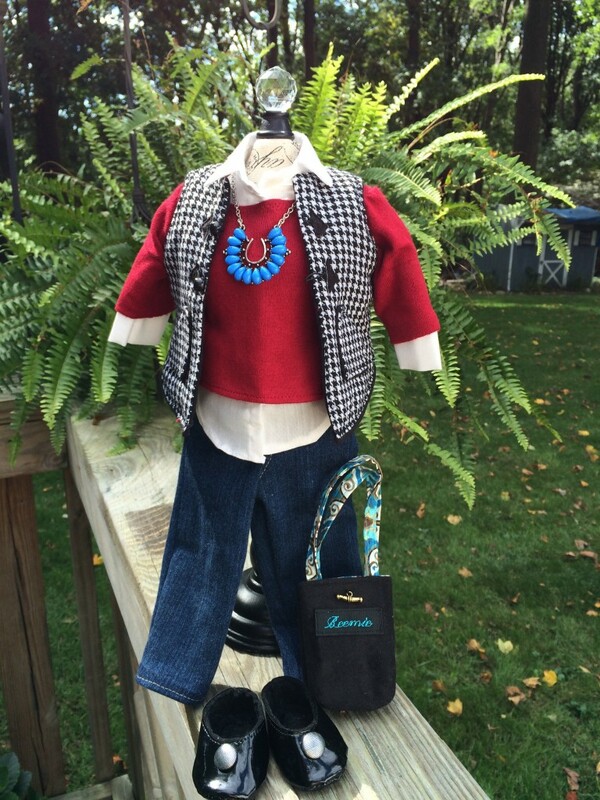 Too funny…I did Pin that vest a while back…it was the inspiration for the outfit. You are right about the perfect number of snow days…only want enough to not have to make up. We will have to see if the snow days produce any “baby” clothes…who knows. Great to hear from you.